Floor sanders - Renovating old board, traditional parquet and block wooden floors is easy with this purpose-made, heavy-duty drum floor sander, removing imperfections, old finishes and most decorative stains to leave the surface ready for varnishing or polishing. Any accessories can be confirmed when our Hire Consultants call you back to confirm your reservation.. Edging Sander/sanders - Sands wooden floors right up to the skirting board to tackle those parts of board, traditional parquet and block floors our floor sander can’t reach. 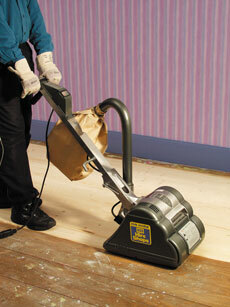 Click on the videos below to see the Floor Sander and Edging Sander in action. Hire Pack (05429): Combined rate includes Floor Sander (05412) & Edging Sander (05422) - Save £26.60 per week!